What is Hydro Electricity ? How Hydro power plant works ? In Hydro-power energy is transferred from potential energy into kinetic energy and from kinetic energy to electricity using turbine. This is a video of final year engineering project carried out in Mangalore. The idea behind the project is develop suitable digital control system to control the frequency,monitor all parameters and protect from abnormalities and to send SMS on failure and as and when required. please note that green pipe shown in video not sufficient as someone comment on garden hose.the system is designed to operate at a head of 60 m and a discharge of 20 liters/sec with 6 inch pipe as a pen stock. Another form of Hydropower project is Hydrokinetic where we use kinetic energy of moving water at the place of potential energy of stored water. Hydrokinetic(Hydro means water and kinetic means motion) is science of water in motion. Man learned using nature’s force for its own use since ancient times. In Greece people used river water flow for grinding wheat.Though, many people are already working in this field but still lot more can be done because many sources of this energy are still not get used. There are many ways different ways to harness this kinetic energy of water such as Ocean currents, Tides, Flowing Rivers and even irrigation canals. 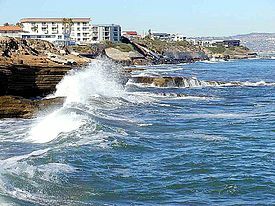 Anyone who has spent some time near the shore or swim against the river flow knows about the immense power of waves. In this post we will try to how we can use this energy for our benefit and what are the different ways people are already harvesting it. We can divide hydrokinetic in many sub sections. For example Tidal Energy which is a form of hydropower that converts the energy of tides into useful forms of power – mainly electricity. The most common use of hydrokinetic is dam where we store large amount of water to use it later for moving our turbine to generate electricity. Though dams contribute lots to our economies but they have some environmental issues too. In this post we will try to find out ways to generate electricity with minimum environmental impact.We will find out ways to generate electricity using river flow without building dam. Is it possible to produce power from moving water without the use of a dam? Yes, it is possible and on 20th August 2009, first project of this kind has started working commercially on Mississippi river. 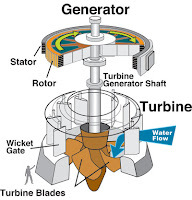 They are using turbine from Hydro Green Energy, captures the flow from the output channel of an existing hydro power dam.These turbine use Instream Energy Generation Technology which is like planting windmills in the water and is environmentally friendly. Read more. Devices which are used in this project are known as wave energy converters (WECs) or rotating devices.One of the most common device is The Pelamis Wave Energy Converter.The machine is made up of connected sections which flex and bend as waves pass; it is this motion which is used to generate electricity. Marine Hydrokinetic Renewable Energy: Increasing Velocity for Underwater Power Extraction in the Hydraulic Flume. 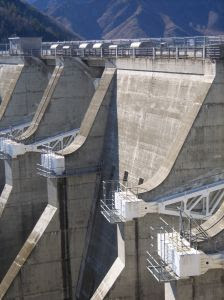 The Subject matter is all over the World facing Energy problem, So I am trying to Explain an idea for Old & New Dams / Reservoirs Hydro electric projects Civil Design Geometry Can be modifying in Architectural Transition to increase our energy potential. Because we are Losing heavy quantum of already storage water in our Big Dams and its relevant projects to generate Hydro Electric old technology, Now it must be need to convert into new theory of Scientific Technology as per utilizing in the way of experiment with foreign expertise at any Hydro electric base Model of concern Department or forum to finalize the following unique and entire world Globalize developing idea for its further implementations in the current ongoing and next coming future Hydel projects as soon as possible. 4. It doesn’t mean that my self have no proper proposal for describing because this one is a serous issue for entire world to escaping the current energy crises. During in 30 years jobs mostly work on Topographic & as built Surveys.Observations & Knowledge come through different Projects and Sites in the due course of my whole life.